Astrophysicists at the University of Waterloo have been able to capture the first composite image of a dark matter bridge that connects galaxies together. 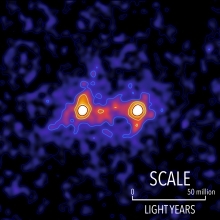 Dark matter filaments bridge the space between galaxies in this false colour map. The locations of bright galaxies are shown by the white regions and the presence of a dark matter filament bridging the galaxies is shown in red. For decades, researchers have been predicting the existence of dark-matter filaments between galaxies that act like a web-like superstructure connecting galaxies together,” said Mike Hudson. “This image moves us beyond predictions to something we can see and measure. By using this technique, we’re not only to able to see that these dark matter filaments in the universe exist, we’re able to see the extent to which these filaments connect galaxies together,” said Epps.